« *** WINNERS *** Heather and Lisa are Living the Life of Riley! CONGRATULATIONS! Being a woman means there's one thing I can never have too many of...SHOES! Now, that I'm a stay-at-home mom and not out in the work force anymore, I wear a MUCH more casual uniform. Because of this, I've had the opportunity to discover designers I would have never known existed otherwise. Take for instance, Sanuk. 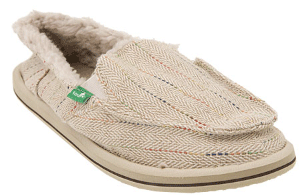 Sanuk creates shoes which are made for comfort and FUN! They carry three main styles of shoes, including Sidewalk Surfers, Tube Flops and Sandals. I recently had the opportunity to slip into the Sanuk lifestyle and review a pair of their very popular Sidewalk Surfers. Keep reading to find out more! 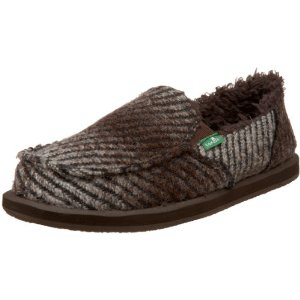 I reviewed the Donna Chill Chocolate Sidewalk Surfers from Sanuk, which retail for $50.00. Sanuk makes a whole slew of fun, comfortable shoes perfect for running everyday errands, taking a stroll around the block or surfing at the beach. When browsing their selection of women's shoes, I immediately fell in love with the Donna Chill Sidewalk Surfers. 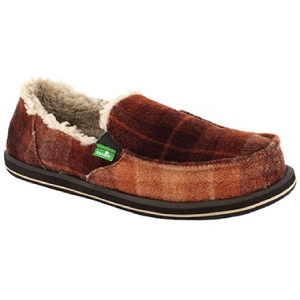 This pair of shoes would keep my toes nice and toasty this winter, and they looked so comfortable and stylish too! I have to admit though, that I was pretty disappointed when my Sanuk shoes arrived and the pair of shoes below is what I actually received. How could this be? The shoes in the lower picture don't look anything at all like the shoes above! Well, after some investigating, I found out that Sanuk's website could use a little improvement when it comes to how they list the Donna Chill Sidewalk Surfers. What I received was the Donna Chill Chocolate shoes and the picture above shows the Donna Chill Cream shoes. The problem is, that Sanuk never even shows a picture of either the chocolate or rust pair that they offer, only the cream pair, which apparently is sold out. I don't understand why the pictures of the chocolate and rust pairs of the Donna Chill Sidewalk Surfers are nonexistent, since these don't even look like the same line of shoes to me. The pattern and even material of the various Donnas look very different from each other, as you can see by comparing the cream, chocolate and rust shoes pictured here. After I finally got over my dismay of not receiving the shoes I thought I would, I actually tried on the Donna Chill Chocolate pair and boy, were my feet in heaven! These shoes are SO VERY COMFORTABLE to wear and actually feel like I'm wearing a pair of soft slippers instead. If you need a wonderfully comfortable pair of shoes this winter for beating the pavement while Christmas shopping or running all sorts of holiday errands, then I highly recommend the Donna Chill Sidewalk Surfers from Sanuk. Wearing these shoes this season, I know my toes will be toasty and stylish all at the same time. Just a word of caution... make sure you know exactly what your shoes will look like before placing an order! Disclosure: I received the Donna Chill Chocolate Sidewalk Surfers from Sanuk in order to facilitate my review. No other compensation was received. This product review is based on my own personal experiences with this item and is completely honest and objective.